I’ve been seeing reincarnations of the Grateful Dead in Camden for almost 20 years. The outdoor amphitheater has changed names a half dozen times since the first Furthur Festival when the Other Ones stepped into town during the late 90’s at a much faster pace than the Camden Waterfront where it is located. My relationship with the music of the Dead along with the live Dead experience has also changed. They’re my go-to band whether it’s celebrating the good times or getting through the bad ones. Throughout it all, the significance of each song has shifted along with the variations happening in my life. Walking into the venue last night, my buddy who I’ve been to over a hundred various shows with over the years summed it up as best as any Dead fan could by saying: “it doesn’t matter what they play, the most random song you’re not even thinking about right now will end up having the biggest impact on you.” When it comes to the relationship between myself and the music of the Grateful Dead, no statement is any more direct. Since the death of Jerry Garcia, the question looming with any representation of their music has always been what guitarist is going to step into his big shoes. John Mayer is the latest guitarist in a line of great ones to take the helm and he may be the best out of the bunch. Dead and Company had no problems holding back on the ‘Jerry’ songs last night, five straight ones opened the show. And Mayer had no problems jumping right into it with the quintessential Jerry opener, ‘Bertha.’ In the post-Jerry Dead following there are two schools of fans, Bobby-guys and Phil-guys. The Dead and Company, represented by 3 of the original core 4 members of the band, is led by Bob Weir. 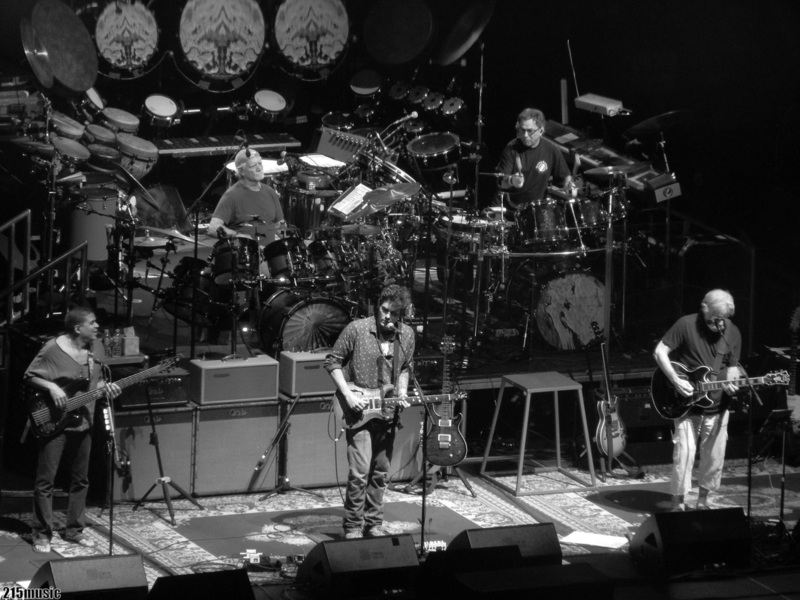 His motions lead the charge throughout the night keeping the Rhythm Devils (original drummers Bill Kreutzmann and Mickey Hart) in line with newcomers John Mayer and bassist Oteil Burbridge (filling in for Phil Lesh who no longer tours extensively). Even the keyboard player, longtime Dead servant Jeff Chimenti, comes from Bobby’s long-time post-Dead outfit: Ratdog. This band is definitely Bobby and the Boys and if you’ve seen Ratdog you definitely saw the Bobby stamp on the slower tempo’d versions of Shakedown Street and West LA Fadeaway that followed the opening staple. In terms of Dead songs carrying different significance throughout my life, a true representation of this sentiment can be found in a song like ‘Row Jimmy,’ the perfectly placed centerpiece of last night’s first set. It’s the classic “song that you hear is a song of your own” type of Dead song. It was also the part of the night where the ‘patient intensity’ that characterizes this current inception of the Dead’s music begins to take shape. Mayer took the Jerry vocals on this one and it was hard for me not to get a warm chill when he belted the line: “that’s the way it’s been in town/ ever since they tore the juke box down.” For years, I felt the song was about heartbreak during the Great Depression but these days it’s hard not to reflect on how lucky I have been to see the Dead post-Jerry over the past two decades. A summer without any version of the Grateful Dead is a crime towards American music. It warms me up thinking about an interview that came out earlier this year with Bob Weir talking about the Dead and Company being a concept to keep their music going strong forever. It’s a song like ‘Row Jimmy,’ a song which had far less significance for the younger version of myself, which provides a classic example of how different songs hit you at different points in your life being that tonight it was the catalyst towards the magic I’ve become accustomed to discovering at Dead shows. The idea of time shifting, or ‘the wheel’ turning, is part of life. This lyric shows me that despite these changes, the music (specifically the music of the Dead) will always be there. After perfectly segueing into and out of ‘Crazy Fingers’ (the fifth Jerry song to start the show!) we finally got Bobby doing what he does best, singing Bobby songs in the always rocking ‘I Need A Miracle.’ ‘Big Railroad Blues’ was the only song that felt out of place as it closed the first set but at this point the audience was sold. There was not a doubt in my mind or in the minds of anybody around me that a further dose of magic was in store for the second set. I’d be lying if I told you I didn’t leave the show smiling from head-to-toe. I’m always loving the Dead but the last couple excursions into their universe with Fare thee Well and last Fall’s first Dead and Company Tour have been far and away the best post-Jerry representations I have witnessed over the years. It’s always a pleasure seeing all the different demographics that come together at a Dead show particularly when I see a lot of younger people getting into the music. There has to be something said about the magic I feel during a show as I’m not the only one that comes back. The only complaint I had leaving the show is that they’re not playing Camden for another night as I would most certainly be making the effort to see what else this wonderful band has in store. All I can do is hope Bobby holds onto the dream of the Dead and Company being something as big as he stated in that interview from earlier this year. One thing is for certain, if they continue to tour I will definitely be coming back for more.